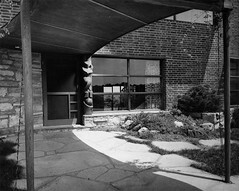 Entry to Dr. Evarts Graham Residence. A sort of totem appears to support the right side of the entry canopy. The design evokes intentional contrasts between natural form, natural materials, abstract form, and modern materials. Vines curls around wires leading them onto the canopy. The massive limestone wall at the left directs the eye to the entry. The curved forms of the overhead canopy, including its tapered columns, speak to Armstrong's simultaneous engagement with modernist form and natural materials.